Whether you’ve gone DIY by choice or necessity, sewing your own swag is a great way to get what you want at a price you can stomach. Even if you’re just a beginner, lots of easy projects can be completed in an afternoon with great results. Need new curtains? Make them yourself! Fortunately, Tokyo isn’t short on places to stock up your sewing kit. 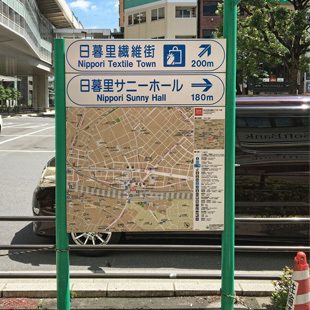 While a variety of stores are spread across the city, a veritable pin cushion of retailers can be found right on the Yamanote Line in Nippori Textile Town—also known as Nippori Fabric Town, Nippori Textile District, or Nippori Fabric Street. 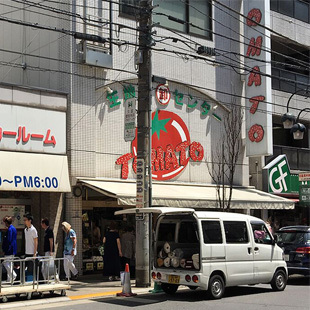 Identity crisis aside, this one-kilometer strip dates back to the Taisho Era (1912-1926), and is home to around 100 stores, offering everything from straight pins to fat squares. Exiting at Nippori Station’s East Exit, you’ll immediately see signs leading you to your destination, located only a few minutes from the station itself. Nearly everything is situated along a single street, but some hidden gems can be found along neighboring streets. For a list of what’s available, grab an official map of the area; they’re free, and can be picked from the cashiers of most shops. Part of the fun is exploring the area for yourself, with good deals and rare finds scattered throughout. A lot of the smaller shops seem to have been around for ages, with knowledgeable staff who are happy to help you find what you’re looking for. (You’ll get a cooler response in the wholesale stores, unless you’re planning to make a significant purchase.) 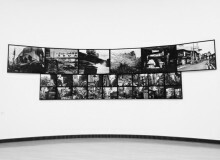 Still, if you’re looking for some more direction, Metropolis has a few recommended destinations to get you along. Only a block into Textile Town, this two-room corner shop is a good place to start. The front room has sewing patterns and basic supplies, as well as a limited selection of sewing machines, including models from the much-lauded Bernina brand. 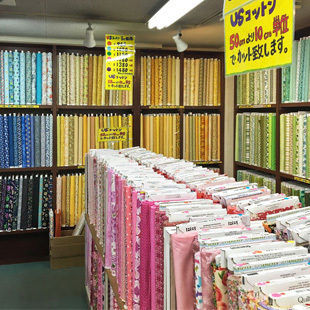 In the back, you’ll find a small but diverse selection of fabrics starting at around ¥300 per meter. Your favorite rice topping is now your favorite textile store! As the name suggests, Furikake is full of “sprinkles”: beads, sequins, and metal bits and/or bobs. The top floor has an eclectic selection of fabrics, including a metallic mesh perfect for the Game of Thrones cosplayer on a budget. One of the largest sewing machine stores on the strip, the appliances on display here range from basic models that start at around ¥12,000, to high-end varieties going for ¥100,000 or more. As an added bonus, there are stacks of scrap fabric, so you can give a machine a test run before you take it home. If Textile Town was a Monopoly board, Tomato would be winning. Occupying multiple spots along both sides of the street, Tomato has separate storefronts for upholstery, high-end garments, sewing tools and discounted goods. But the main attraction is Tomato Honkan. Spanning a mighty five stories tall, they’re almost guaranteed to have whatever you’re searching for, and at a decent price to boot. Fabric-wise, there’s everything from official Life magazine prints and Lichtenstein to more traditional Japanese designs. There’s even a dedicated floor for formal wear, with its own soundtrack: during my visit, I was treated to the darling child of Tokyo’s music collection: smooth jazz. 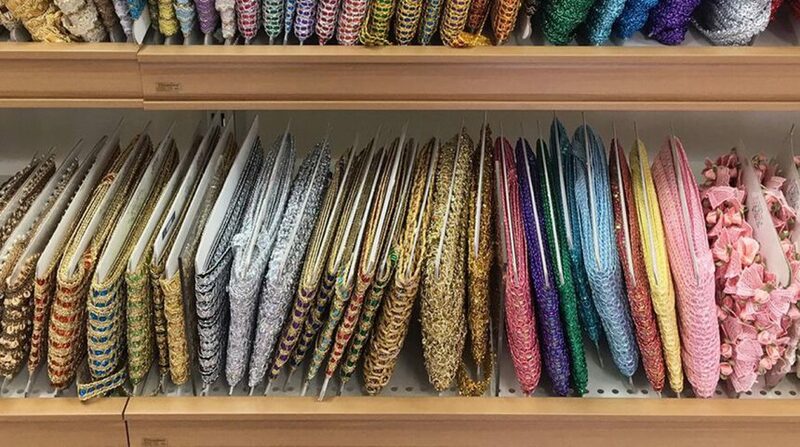 You’ll want more than you can carry, but they’ve planned for that: each floor has its own set of rolling fabric bags that can be used to wheel your selections to the cutting table. So, what are you waiting for, thrifty? Halloween is a few months away. Haven’t you got a costume to make?